Use the form to enquire about accommodation at Mt Buller Chalet. Tariffs are subject to change at the Hotel's discretion and without notice. Mt Buller Chalet One Bedroom Suites offer extra space and comfort on your luxury stay with separate bedroom and lounge areas. Perfect for couples and families with all the comforts of home. Our apartments also contain a kitchenette. The Mt Buller Chalet King Rooms are generous in size, most have views overlooking the Bourke Street ski run or the Delatite Valley. Nestled high in Victoria’s spectacular high country, Mt Buller Chalet is the ideal place to get away from it all. Mt Buller Chalet is a seasonal hotel where you can experience our warm mountain hospitality, views that will take your breath away and a sensational dining experience during the winter season. There is a warm alpine welcome awaiting you at Mt Buller Chalet Hotel & Suites with 61 beautifully appointed king rooms and suites to choose from. You will feel like you are a world away when you look out your window to the sweeping mountain views and decide whether to head out and explore the countryside or simply savour the peace and quiet of curling up in your room. The fresh high country air does wonders for the appetite and we have plenty of delicious dining options for you to choose from during your stay. Treat yourself to a fine dining experience, curl up with room service or head out with a specially prepared picnic hamper. Our Black Cockatoo Restaurant offers a fine dining experience for breakfast and dinner whilst Apres Cafe has a relaxed, cafe and bar atmosphere. 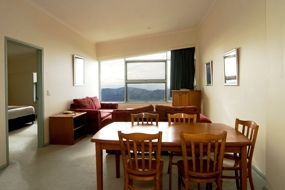 Guests can enjoy an extensive range of facilities and services to compliment their stay at Mt Buller Chalet & Suites. The hotel offers two distinctive restaurants and bars, Black Cockatoo and Apres. Ski straight off Bourke Street to an outdoor table and sip a schnapps while swapping stories with friends – and making some new ones! The award winning Black Cockatoo Restaurant has an ever-changing menu and if you feel like a quiet night curled up in front of a movie, ask us about room service. The hotel has a luxurious indoor heated pool ~ always at 28.C, spa and sauna and fully equipped gymnasium as well as a squash court. During the winter season there is a full rental & retail outlet. Our reception is staffed 24 hours during winter if there is anything you need, simply call and the team will do their best to help!